I finished my first twin quilt! 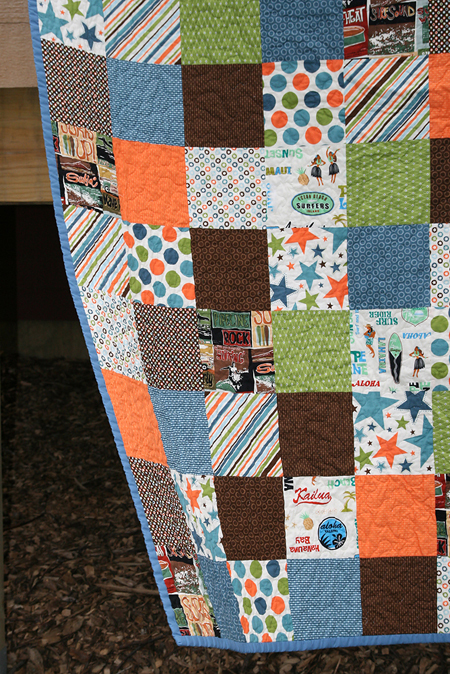 This quilt was made for my husband's cousin's son (got that? LOL) who is moving to his "big boy" bed from his crib. I had a great time making it, and I feel like I've really accomplished something as it's the biggest quilt I've made so far. I was thinking of everything I used for this quilt...12 yards of fabric, 130-7.5" squares, 500+ meters of thread, 1 package of batting, 350 basting safety pins, 3 hours of sewing binding....I feel like I should finish by singing "And a partridge in a pear tree!" 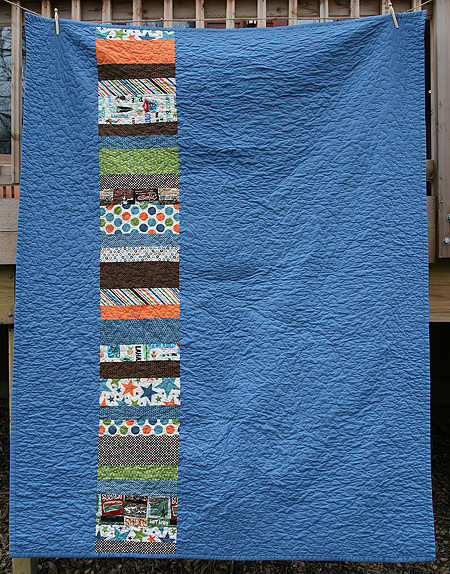 This one is quilted free motion and it took about 4 hours which was less time than I expected. I knew that binding would take a while though and it did! Totally worth it though. Does anyone else start getting REALLY excited when you see that you are almost done hand sewing that binding and nearing completion? 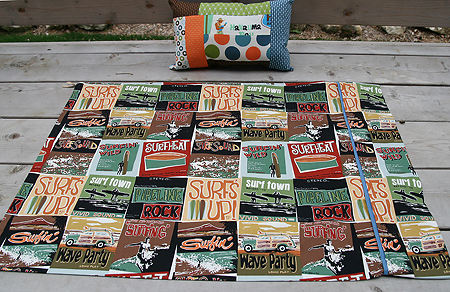 The back is a Kona Solid and stripe of the fabrics used on the front. 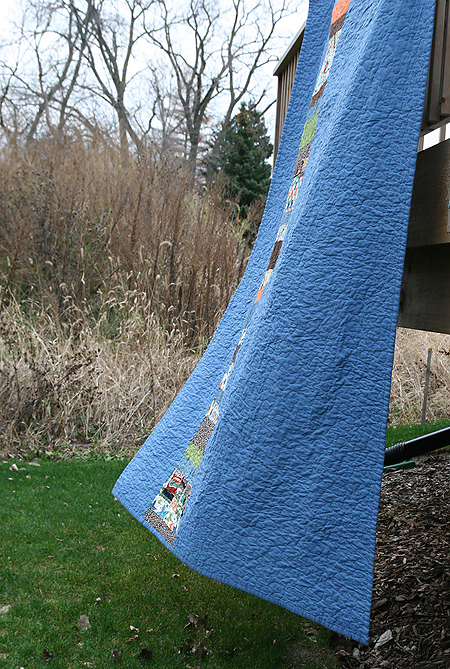 I just love these "windy quilt" photos. And one thing we have a lot of in Chicago is wind. I also made a pillowcase using this tutorial and a throw pillow from the scraps. 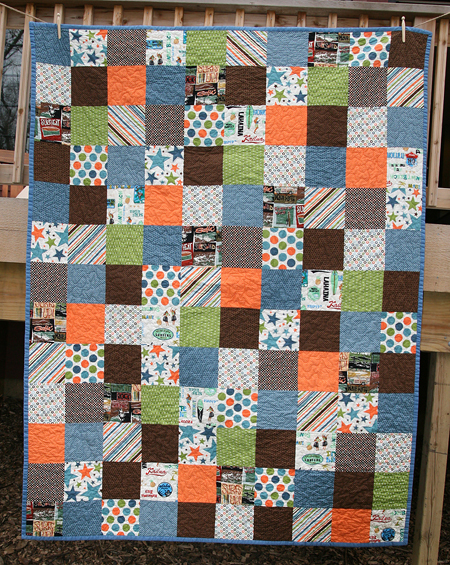 I think this will make an adorable little boy room that he can grow into for years to come!